Babies and sleep, sometimes it seems as though they will only sleep when we don’t want them to and can somehow manage to get less sleep than humanly possible. I think most parents would agree that they would literally do anything or buy anything that would actually help their babies sleep better. Enter the Lulla Doll. This amazing little creature has a heart beat and breathing noise that has been clinically tested to help babies sleep better and longer. 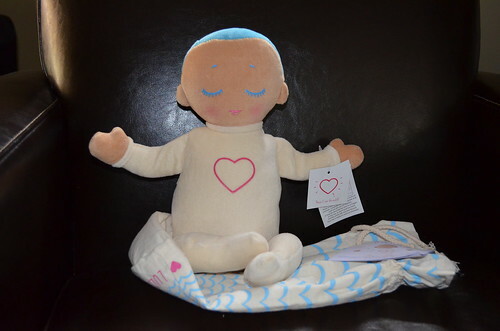 In the research cited by the makers of the Lulla Doll, RoRo, when babies hear a heart beat and the breathing of another person they fall asleep sooner and sleep longer at a time, their heartbeat and breathing stabilize, it reduces the chances of SIDS, their neurological development increases, their stress levels lower, and they cry less. It almost sounds too good to be true, right? But the doll has been tested at the Icelandic Hospital in the NICU and the results were very positive and the results from that study are set to be published shortly. I would have loved to have had this doll when either of my kids were newborns, but since my baby is now ten months old and a pretty great sleeper I thought I would try it when she wasn’t feeling well and teething (since they happened to both hit us at the same time) and her sleeping was being disrupted. When I put her Lulla Doll on (with a very simple squeeze of the doll’s heart area) she was immediately intrigued and calmed down enough to sit and stare intently. She seemed to like having the company in the crib and it certainly distracted her enough to get her to simmer down. I also fully intend on using Lulla when out and about as my babe isn’t keen on sleeping in the stroller or car and there are just times where I desperately need her to. I have had a fairly large number of friends who have given birth pre-term in the last few years and I think every one of them would have jumped at the chance to have one of these dolls. There is also a great safety feature attached to the doll, which is a strap which can attach it to the side of the crib as it is recommended that no dolls or blankets be kept in the crib until approximately a year. This should alleviate any concerns a parent would have about the safety of the doll for very young babies. The Lulla Doll is currently available online at Hestia International and will be popping into retailers in the next few months in the Toronto, Ontario area. Lulla retails for approximately $99 CDN. If you are looking for a Christmas present for a friend who is expecting or a baby gift for somebody who already has everything or perhaps a gift for a preemie, take a look at Lulla. How cute! Love the doll! What a fantastic photo, love it. This doll is a wonder and perhaps just what the Dr ordered for my grandson who is 4 and hasn’t slept through one night since birth! That is a great idea for a doll and really cute. Had to drop by to share this on Facebook for my friend i was telling her about this Doll last night and she was excited to see it,,she is due in March with twins.